Charles Dickens is as much a fixture of our Christmas culture as a turkey dinner with all the trimmings. 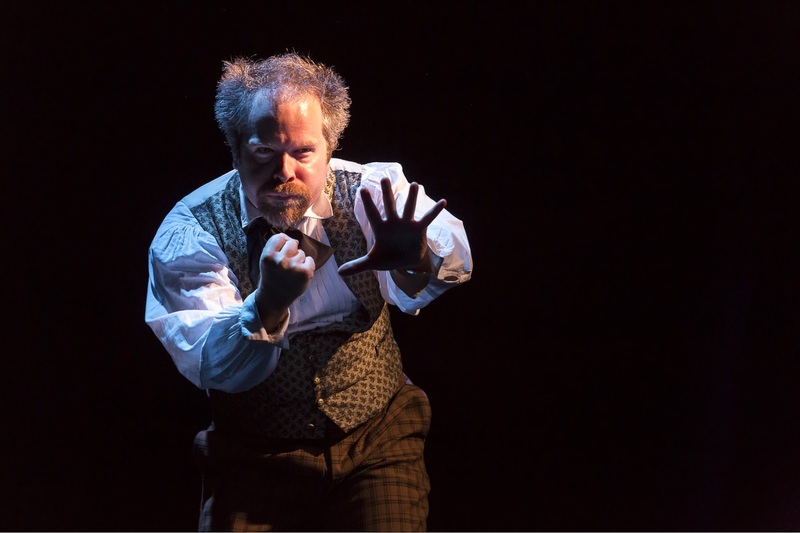 So cue Adam Long, a man with impeccable form in abbreviating classic English texts and a co-founder/creator of the Reduced Shakespeare Company. Having given us the Bard's complete works (abridged), Long has now moved forward a couple of centuries and fixed his canon upon the works of the great Victorian with Dickens Abridged being a hilarious 90minute zip through some of the writer's classic treasures. Five guys play all the parts (including some female roles),with Damian Humbley mostly playing Dickens. Opening with Oliver Twist and with some lovely nods to the Oscar winning movie the humour is sharp throughout and the songs (with music all played by the talented band of actor-musicians) having a folksy acoustic guitar sound. Un-mic’d, the occasion has the air of a top-notch Edinburgh Fringe performance. Humbley is, as always, West End gold. An Australian actor, playing an English writer who for some inexplicable reason along with the rest of the cast, is speaking with a Californian accent. (Maybe so American tourists will understand?). His waist-coated and bearded writer is a joy throughout, never more so then when as an aged and demented Dickens, he is visited by some of his fictional characters seeking revenge for the misfortune he has heaped upon them. The show does not demand an intimate knowledge of the novels, although a passing familiarity with some of the more famous books such as A Tale Of Two Cities and David Copperfield will only add to the evening’s enjoyment. The irreverence is gorgeously affectionate. Jon Robyns, fresh out of Spamalot and playing amongst others Mr Bumble and Dickens’ wife is a scream, whilst Gerard Carey’s Tiny Tim (with electric guitar for a crutch) is another comedy gem. The guillotine moment from A Tale Of Two Cities is bloodily re-enacted (fear not though, the emphasis is on the humour rather than the horror) with an inspired moment of a decapitated Robyns on mouth organ that will stay with me for a long time. Kit Orton and Matthew Hendrickson complete the talented company and for a clever Christmas offering, you won’t find funnier. The best of times? Undoubtedly. Dickens Abridged certainly left me wanting more!